We first caught up with J Fernandez at our CMJ show back in 2013, and were pumped to run into them again on the tail end of their SXSW journey at this private show an hour away from the madness. Here, the band performed a stripped-down set that included new material as well as offerings from their excellent two-EP collection of No Luck and Olympic Village. Though run ragged from a very busy schedule over the week, J Fernandez played this private show with real panache, with these songs coming to life as live numbers in a way that distinguished them from their lo-fi EP counterparts. The band, like most of their counterparts, has been on the festival circuit heavily this summer, most recently hitting Canada with comrades Alvvays, and returning to that country next month for POP Montreal. We can’t wait to see what this guys will do next. As you can see in the photo, I recorded this set simply, with Schoeps MK4V microphones right in front of the band. The vocals are a touch low in places owing to the DIY setup, but overall the sound quality is excellent. Enjoy! Thanks to J. Fernandez for permitting this recording. 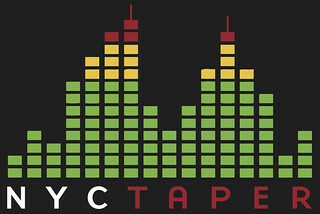 If you download this recording from NYCTaper PLEASE SUPPORT J Fernandez, visit his blog, and purchase No Luck / Olympic Village from the links at Soundcloud [HERE] or on iTunes.